Hybrid California SageEvergreen perennial. Oval leaves are silver gray. 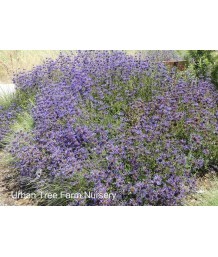 Bright bluish-purple flowers..
California Hybrid SagePerennial. California native. Fragrant bright green leaves. Delicate white to ..
Cleveland/California Blue SageEvergreen shrub. Wrinkled, toothed gray-green leaves to 2 inch long ar..
Cleveland/California Blue SageEvergreen shrub. California native. Dense habit. 1 inch long gray gree..
Cleveland/California Blue SageEvergreen shrub. California native. Upright arching habit. 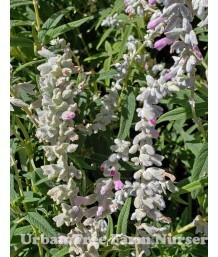 1 inch long..
Clevland Sage/California Blue SageEvergreen shrub. 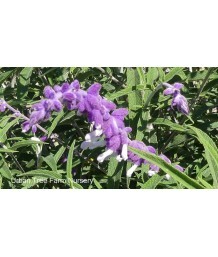 Light purple flower whorls appear in spring and s..
Mexican SageEvergreen in mild climates. Mostly deciduous where there is frost. Vigorous, upright, ve..
Mexican SageEvergreen perennial in mild climates. 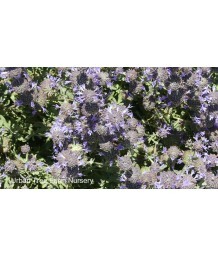 Stems have long, narrow grayish leaves covered wit..
Mexican SageEvergreen perennial in mild climates. Compact habit. Stems have long, narrow grayish lea..
California Carpet SagePerennial. Pleasantly aromatic green leaves are lance-shaped and tinged with p..
Sweet BoxEvergreen shrub. Low growing habit that spreads by underground runners up to 8'. Branches a..
Sweet BoxEvergreen shrub. Compact growing habit stays low and tight. Darkest green leaves are glossy..
Sweet BoxEvergreen shrub. Slow growing. Irregularly arching branches. 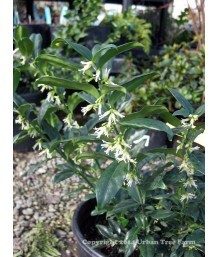 Medium-sized dark green glossy..
Silver Leaf CassiaEvergreen shrub. Feathery, fern like silvery gray-green foliage. Bright yellow flo..
Prostrate Coast RedwoodEvergreen conifer. Slow growing, low groundcover. Only grows about 6 inches p..
Blue Potato BushEvergreen shrub. Pruned into a small, single trunk patio tree. Sprawling habit that ..
Paraguay NightshadeEvergreen shrub. Fast growing. Somewhat sparsely foliaged, irregularly-rounded fo..
Paraguay NightshadeEvergreen shrub. Trained to grow along an upright stake in the center of the cont..
Paraguay NightshadeEvergreen shrub. Pruned into a small, single trunk patio tree. Fast growing. Some..
Paraguay NightshadeEvergreen shrub. Already trained to grow on a trellis. Fast growing. Somewhat spa..
CA Native NightshadeEvergreen shrub. California native is slightly more compact and mounding than ot..
CA Native NightshadeEvergreen shrub. California native is slightly more compact and low mounding tha..
CA Native NightshadeEvergreen shrub. Loosely spreading habit of grayish-green soft foliage. Lightly ..
Australian Bluebell CreeperSemi-evergreen vine. Green foliage contrasts with small light blue flower.. Giant Bird of ParadiseEvergreen in mild winters, needs protection from frost/freeze. Long stalked bl..
Bird of ParadiseEvergreen in mild winters. 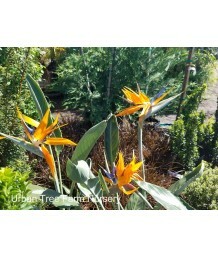 Somewhat hardier than Strelitzia nicolai, still needs pro..